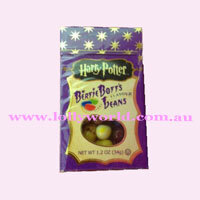 Harry Potter Bertie Botts Beans the 34g Harry Potter Jelly Beans made by Jelly Belly contains weird and wild flavours. Be warned there is some really gross flavours such as Earwax and Rotten Egg. Harry Potter Bertie Botts Beans the 34g Harry Potter Jelly Beans made by Jelly Belly contains weird and wild flavours. Warning! there is some really gross flavours such as Earwax and Rotten Egg.